During the 2000-2001 technology bubble burst, inventory was a looming evil that hung over the assembly houses, dragging the sector under and preventing fast recovery. The notion of lean manufacturing, regardless of company size or end-market, took hold, and electronics assemblers have been wary of building up chip inventories ever since. With the current recession battering other sectors more brutally than it is hitting technology companies, we can ask, Did we learn a valuable lesson nearly a decade ago? One indicator is the monthly chip buying indices from the Electronic Components, Assemblies, and Materials Association (ECA) and the Semiconductor Industry Association (SIA). “I think we are seeing adjustment of inventories from manufacturers and distributors based on market slowdown,” said Bob Willis, ECA president, adding “The industry learned a lot from the train wreck of 2000. There is more transparency in the supply chain, enabling companies to better anticipate changes in demand and adjust accordingly.” To measure the success of supply chain management, we can examine the numbers for component orders in 2009. In January, orders were in freefall, as the global recession slashed consumer demand, corporate spending, and auto sales. New projects were put on hold, and volumes decreased. Did this lead to overstock? It seems not, as component orders continued to fall in February, but not as sharply as in January, according to the monthly index compiled by the ECA. The 12-month average, comparing 2009’s results to last year’s, continued a descent that began last summer and has continued through the present. By March, orders ticked up slightly. Worldwide sales of semiconductors were $14.7 billion in March, a gain of 3.3% from the prior month when sales were $14.2 billion, the SIA reported. ECA’s numbers confirm that component orders bounced back slightly in March from lows in the first two months of the year. “The modest sequential rebound in worldwide sales in March suggests that demand has stabilized somewhat, albeit at substantially lower levels than last year,” said SIA President George Scalise. For SIA's geographic breakdown of orders, see the above charts. So demand was lower than the prior year, but without the stocking hangover experienced in the last recessionary period. 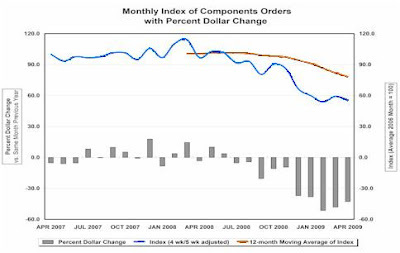 Electronic component orders dipped again in April, ECA reported (see graph). 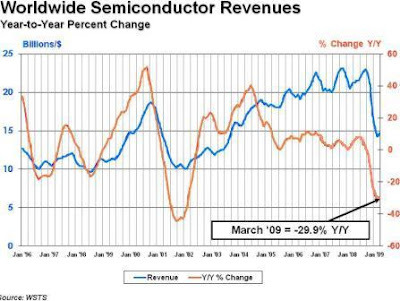 Worldwide sales of semiconductors rose to $15.6 billion in April, SIA saw, an increase of 6.4% from March. April sales were 25% lower than April 2008 when sales were $20.9 billion. ECA's Willis thinks that many OEMs, wary of continuing uncertainty in the market, are only buying parts for which they have firm orders from customers. “As stimulus programs begin kicking in, the consumer electronics industry could see some stabilization,” said Willis. “If so, this should be reflected in new orders that would bring a slow recovery beginning in late summer or early fall.” Economic stimulus measures in the U.S. combined with other countries’ stimulus plans will begin to impact sales as we enter 2010, was Scalise’s SIA assessment. SIA reports that sales for Q’01 2009 amounted to $44.0 billion, a 29.9% decline from the first quarter of 2008 when sales were $62.8 billion. Sales declined by 15.7% from Q’04 2008 when sales were $52.2 billion. Sales in all geographic regions except Japan showed month-to-month gains. Sales in Japan were sharply lower, reflecting a drop in the country's economic output. All geographic regions reported lower first-quarter sales compared to the same period of 2008 (see graph). Smaller volumes and longer consumer purchasing cycles are hallmarks of recession and truly are destroying some giants of industry, particularly in the automotive sector. With component purchasing at levels below those pre-recession, no one can claim surprise. However, seeing demand rebound so quickly as to be measured in months rather than years impresses upon us that the electronics sector has made good use of hard lessons learned earlier in the decade. Although is estimated that the U.S. electronics industry consumes less than 2% of the world’s lead, efforts to comply with the ever-changing RoHS Directive from the EU have disproportionately affected our industry. Design engineers should watch their bill of materials (BOM) costs because of new changes to RoHS, as overseeing governments phase out and expire some of the RoHS exemptions in the near future. The European Commission (EC) has followed the guidance of two consultants: Fraunhofer IZM and Oko Institute. The EC allowed exemptions to RoHS when no technical alternative to the current technologies is possible. However, a general pattern is for the EC to eliminate exemptions. 6. Lead alloys as solder for transducers in high-power loudspeakers. These exemptions are projected to be in place by 2010 with an 18-month grace period, but what’s the next step? Most expect that more substances will be added or have exemptions lifted over time. Many electronic products, or boards that go into end products, are produced with a reliance on exemptions today. Especially for products designed with long life cycles — such as medical and aerospace electronics — keeping up with the latest changes in RoHS is critical. To discuss the latest inclusions and shrinking exemptions in RoHS, contact the IPC at http://www.ipc.org/ or the EU at http://www.rohs.eu/. Materials innovations are helping to reshape our industry in the post-RoHS, halogen-free era. Environmental constraints, usability requirements, cleaning issues, and other factors are bearing down on solders, conformal coatings, underfills, and all the other “goo” that helps construct and protect an assembly. Check out this week’s soldering products roundup to see some of these innovative chemistries. At APEX 2009, I sat down with Doug Dixon, global marketing manager, at the electronics group of Henkel, to discuss materials trends in the industry, and how suppliers are shouldering the burden. Henkel has been busy since last year’s acquisition of Emerson & Cuming and Ablestik. Now that the majority of integration tasks calendared in since last year’s APEX have occurred, this year’s event found the company releasing new materials resulting from these collaborations. Henkel had two products in the show’s Innovative Technology Center: Multicore LF700 lead-free solder paste and the Hysol UF3800 underfill. Henkel brought in the Emerson & Cuming team while developing UF3800, Dixon noted, and the collaboration proved fruitful. The product won an SMT VISION award this year. UF3800’s benefits include underfilling that flows at room temperature and cures at low temperature, halogen-free, rework-capable, high Tg, lower energy use (due to eliminating pre-heat to flow and cure), and compatibility with many flux formulations. LF700 offers a long abandon time even when printed onto 0.4-mm CSP apertures, reduced voiding in BGA solder joints (due to the flux chemistry), humidity resistance, and high tack force. Its halide- and lead-free ingredients label should also encourage global use regardless of regional environmental restrictions, such as RoHS, China RoHS, and other state-by-state directives. Both the paste and underfill satisfy externally imposed requirements — lead- and halide-free. They also meet internal manufacturing requirements — reworkability, fine-pitch printing, broad flux compatibility — to ease the manufacturing and reporting burden on electronics makers. Dixon said these “hybrid chemistries” are advancements marked on the company’s product roadmap. Acquisitions may seem like a dangerous move in a tight economy, but Henkel’s method of adding units that complement existing product groups is sound: Some products may overlap, but the overall trend is expanding in an application area — not stacking similar products on top of one another. “We go through all our projects and combine resources where it will make a positive impact,” Dixon said. Some projects have natural crossover, like the CSP underfill or certain die-attach products. Others, such as conductive inks, are a new area for Henkel since the National Starch acquisition. Emerson & Cuming has a developed base in the defense sector, so Henkel is working to combine potting/encapsulation and conformal coating IP into new products. The result is a conductive film product called CF3366, which provides RF grounding in PCB-to-housing interconnections. The high-adhesion-strength electrically conductive film is formulated for electrical, thermal and mechanical assembly applications and targets harsh environments with high temperature resistance. It enables thermal release as well as adhesion, tackling two system-level challenges. Beyond acquisitions, Henkel’s business development group partners with universities and research groups for product development on a longer timeline. Joint ventures are another area of interest. A colleague of mine recently returned from a tradeshow with a clear message: Collaboration is king in the new economy. For project developments occurring now to 5 and 0 years down the road, the balance of collaboration and mergers & acquisitions will bring in investments from interested customers, fueling continued R&D in this cautious economic climate. Continuing on this theme of materials evolution, SMT just received a copy of the new publication, Materials Enabled Designs: The Materials Engineering Perspective to Product Design and Manufacturing, written by Michael Pfeifer, president of Industrial Metallurgists LLC. The 12-chapter book covers product design, materials selection, materials reliability and performance considerations, costs and market ramp-up strategies, and other aspects of the process, from the materials engineer's perspective. Look for a review of the text in an upcoming blog post. At APEX this year, we met up with Bruce Isbell, senior strategic marketing manager; Michael Dreyer, sales manager in the manufacturing team; and Tal Shachar, senior software engineer, at Valor Computerized Systems’ booth. Shachar, who works out of Yavne, Israel, introduced us to Ronit Shalev, marketing and sales manager and Uzi Rozenberg, the entrepreneur owner and chairman of U.S.R. Electronic Systems (1987) Ltd., an Israel-based EMS provider offering outsource and turnkey services internationally to high-tech communications, video, security, medical, industrial and cosmetics sectors. U.S.R. implemented Valor’s vCheck quality management software to trace defects along with work-in-process (WIP), reduce costs, and attract new customers based on its quality monitoring and improvement capabilities. “We’re a privately owned EMS company with approximately 700 employees specializing in turnkey solutions. For example, we are producing medical equipment, cardiologic monitoring equipment, portable ultrasound devices, and respiratory equipment for GE HealthCare,” said Shalev. Because U.S.R. manufactures boards for medical and military OEMs, quality verification and tracing capabilities are important. “When we were asked to be a beta site for Valor’s vCheck quality management software, we decided to accept the challenge,” continued Shalev. U.S.R. implemented Valor’s vCheck software to minimize the probability of errors and drive the manufacturing process to optimal performance by balancing quality, throughput, and cost. vCheck’s multi-dimensional quality system is designed to increase profitability by making all aspects of quality testing and inspection visible to any decision maker. It functions as a stand-alone application or as part of a larger manufacturing execution system (MES) suite, monitoring quality for manual and automated inspection and test. vCheck handles WIP tracking at the PCB and box-build levels, and offers repair-loop management and tracking, knowledge-based guidance of failure diagnosis, quality reporting and analysis, enforced process routing, and automated alarms. One problem that U.S.R. had with a customer’s design was completely invisible to management for some time because the defect was continuously repaired by operators as if it was part of a standard process. vCheck created visibility and transparency to all the defects at each specific reference designator and at the exact place in the process. The root of the problem was a connector located too close to the board edge. U.S.R. engineers isolated the design issue by using Valor DfM tools and suggested that the customer change the design. That accomplished, confidence in U.S.R.’s manufacturing skills and in vCheck’s ability to track down the root cause of the problem increased. U.S.R. has weekly quality review meetings with customers to discuss real-time reports on quality data from all PCB manufacturing perspectives including DPM analysis for looking at defects per product, day, month, or year. Defect analysis presents defects by category, defect, type of technology, and which side of the board shows the defect (top or bottom). Using vCheck starts with board-level registration as barcodes and laser-marked unique part identifiers are compared to the work order and placed in the database. For boards without identification, the engineer can attach one on-site. Next, test and inspection data are assembled for all areas: ICT, AOI, WIP tracking, routing control, X-ray, flying probe, manual data collection, functional test and manual inspection. Customized reports show yield, DPMO, first pass and second pass yield, and DPM analysis in a multi-language available report. Repair loop management and tracking with guidance from knowledge-based failure corrections makes certain that defects are corrected before allowing the board to pass through the manufacturing process. “When we look at where we should spend our time to make improvements with the greatest impact, the reports are key,” said Shalev.